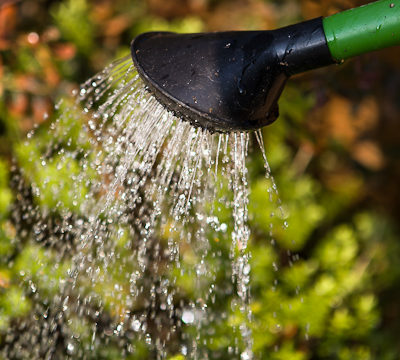 Watering is key during prolonged dry spells at this time of year – and not just for your herbaceous planting. Don’t forget to keep any eye on any recently planted trees, hedging and shrubs. Lawns can be left (unless they were laid recently) – even if they go dry and brown, they will recover with a bit of rain. Ornamental and fruiting Cherry trees (Prunus) should be pruned in midsummer. If you trim your box hedging and topiary now, it should stay looking neat for the rest of the year, though you might want to clip it over lightly in September too. Avoid clipping box plants in hot weather or bright sunlight as the cut areas might burn and turn brown. 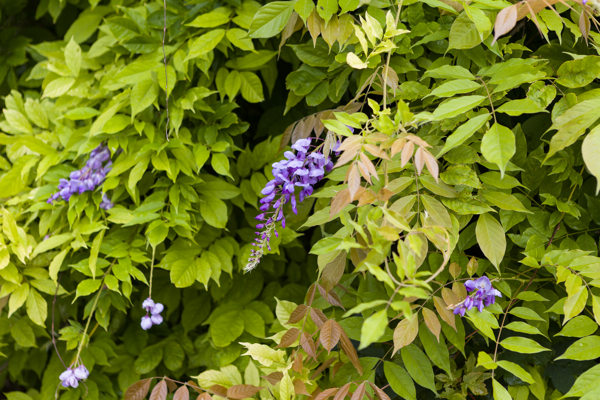 Prune whippy summer growth of Wisteria to within five of six buds of the main stems, and cut main stems back if they have outgrown their space. Deadhead roses and once they’ve finished their first flowering flush, feed them with rose food or general purpose feed (making sure to water in the granules for easy absorbtion). If you grow Philadelphus, make sure to prune your shrubs on an annual basis after flowering. Mature congested shrubs in particular should be pruned by taking out the oldest stems at the base to ensure the production of healthy new flowering stems for next year. Take cuttings of evergreen shrubs such as Camellia and Rhododendrons and prune established Weigela florida after flowering. Feed late flowering perennials such as Japanese Anemone & Asters (sprinkle & water in a general purpose fertiliser). Cut back hardy Geraniums if they’ve finished flowering. This will encourage new foliage, and possibly new flowers later in the summer. Divide old clumps of bearded Iris which have become congested, and replant them. Regularly dead head annuals and perennials such as daylilies (Hemerocallis) and Helenium. Knautia, Scabiosa and Salvia. Use secateurs, snipping stems as low as possible to avoid leaving unsightly stubs. Cut back old flower stems of Delphiniums and Lupins to their base. Plant autumn-flowering bulbs such as Colchicum and autumn Crocus. Raise the blade height of your lawn mower in hot and dry weather. Letting it grow slightly longer will help keep it green. Avoid laying any new turf at this time of year. Top up your pond when the water level drops due to evaporation in hot weather (preferably from water butts not tap water). Regularly add liquid feed to pots and hanging baskets. If you’re going away, move all your pots to a cool shady spot where they won’t dry out so quickly. NB this information applies to gardens in the UK and of course, you need to take account of your own local weather conditions when carrying out any work in the garden. If you’re growing fruit & veg. or flowers for cutting, take a look at my blog on Jobs for the productive garden in July.